The world’s oldest processed gold, the almost 7,000-year-old Varna Gold Treasure from the Chalcolithic Necropolis in Bulgaria’s Varna, was first discovered in 1972 during the digs for the infrastructure of a canning factory in Northeast Bulgaria. The start of the initiative to open up the site of the Varna Chalcolithic Necropolis for visitors has been set with a project of Varna Municipality, Dimitar Dichev from the local NGO entitled “Culture and Tourism of the Bulgarian Northeast” has announced, as quoted by BTA. The preparatory project is due to be completed by the end of November 2015; it is said to be just the first of several projects that will make the site of the world’s oldest gold accessible for tourists. According to Dichev, at present, the site of the Varna Chalcolithic Necropolis is unrecognizable, and only about 30 people, mostly archaeologists, are aware of its precise location which is in Varna’s Western Industrial Zone. He believes that the site will enjoy major interest on part of Bulgarian and international tourists alike. The site of the Varna Chalcolithic Necropolis has been the exclusive property of the Bulgarian government since 2012. In October 2015, the Bulgarian Cabinet granted Varna Municipality management rights over it and five other major archaeological sites in and around Varna as a measure for promoting cultural tourism. After the completion of the initial project for designating the site, Varna Municipality is going to seek EU funding for the further development of the Varna Chalcolithic Necropolis as a tourist attraction, including through the establishment of a tourist information center. The initiative harbors the possibility for further archaeological research of the Varna Chalcolithic Necropolis because about 30% of its known territory has never been excavated. In the excavated section of the necropolis back in the 1970s and the 1980s, the archaeologists discovered a total of 294 graves, including 57 graves with no remains of human bones. 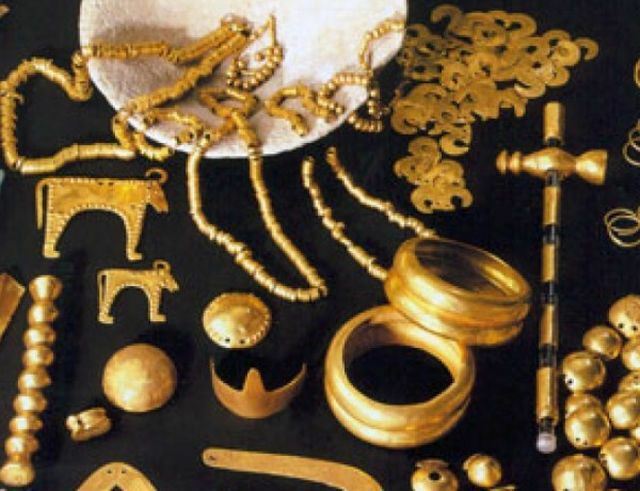 The bulk of the some 3,000 gold artifacts found in the necropolis were found in just three of the graves. All finds from the Varna Chalcolithic Necropolis, including the Varna Gold Treasure, are kept at the Varna Museum of Archaeology. Its most recent exhibitions have been the exhibit “Varna – The Oldest Gold Treasure” on October 14-16, 2015, at the European Parliament’s Altiero Spinelli Building, on the 3rd floor, and the current Golden Legend exhibit in Japan’s Museum of Western Art in Tokyo. For the first time at the Brussels exhibit the organizers invited Raycho Marinov, 65, the man who originally discovered the treasure and the Varna Chalcolithic Necropolis while he was operating an excavator back on October 22, 1972, at the age of 22. Learn more about the Varna Gold Treasure and the Necropolis in the Background Infonotes below. The dawn of Varna‘s history dates back to the dawn of human civilization, the Varna Chalcolithic Necropolis being especially well known with the discovery of the world’s oldest find of gold artifacts dating back to the 5th millenium BC. Ancient Odessos is considered the precursor of the Bulgarian Black Sea city of Varna. It was founded by Miletian Greek colonists at the end of 7th century BC, the earliest Greek archaeological material dating back to 600-575 BC. However, the Greek colony was established within an earlier Ancient Thracian settlement, and the name Odessos had existed before the arrival of the Miletian Greeks and might have been of Carian origin. Odessos as the Roman city of Odessus became part of the Roman Empire in 15 AD when it was incorporated in the Roman province Moesia. Roman Odessos is especially known today for its well preserved public baths, or thermae, the largest Roman single structure remains in Bulgaria, and the fourth largest Roman public baths known in Europe. The First Bulgarian Empire (680-1018 AD) conquered Odessos (Varna) from Rome‘s successor, the Eastern Roman Empire, or Byzantium, in the late 7th century. It is even believed that the peace treaty in which the Byzantine Empire recognized the ceding of its northern territories along the Danube to Bulgaria was signed in Odessos. The wall (rampart) that the first ruler of Danube Bulgaria, Khan (or kanas) Asparuh built at the time as a defense against future Byzantine incursions is still standing. Numerous Ancient Bulgar settlements around Varna have been excavated, and the First Bulgarian Empire had its first two capitals Pliska (681-893 AD) and Veliki (Great) Preslav (893-970 AD) just 70-80 km to the west of Varna. It is suggested that the name of Varna itself is of Bulgar origin. In the Middle Ages, as a coastal city, Varna changed hands between Bulgaria and Byzantium several times. It was reconquered for the Second Bulgarian Empire (1185-1396 AD) by Tsar Kaloyan (r. 1197-1207 AD) in 1201 AD.